Freidman Memorial Airport Manager Rick Baird addressed the Bellevue City Council Monday about noise from incoming and outgoing airplanes, saying it used to be louder when he started working at the airport as an air-traffic controller. “It is quieter now than it was 20 years ago,” Baird said, due to voluntary noise-abatement procedures that keep most pilots from flying between the hours of 11 p.m. and 6 a.m.
Baird touted the airport’s “good neighbor” policy, which regularly reminds pilots using Friedman Memorial Airport that neighborhoods underneath them depend on adherence to the policy in order to get a good night’s sleep. The voluntary policy also requests that aircraft above 12,500 pounds never land from the north or depart to the north, and that they follow specific flight paths, when possible, that would reduce noise impacts on Hailey and Bellevue. Baird said most of the flights taking place after hours are medical emergency life flights to or from hospitals. 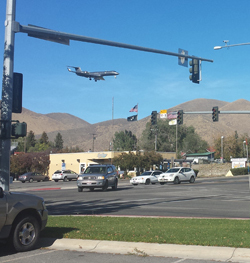 Baird recently received a barrage of complaints from Chantrelle subdivision residents, who live under the flight path of aircraft arriving and departing from the airport. Baird dismissed the complaints while presenting a slideshow of recommended noise-abatement flight paths, which often direct aircraft directly over Chantrelle, rather than more populated areas. “If your goal is to bog down the system with complaints, I can’t take the time,” he said. Bellevue residents have criticized the Bellevue City Council for not attending Freidman Memorial Airport board meetings in order to keep up on such issues. In response to the criticism, Mayor Chris Koch recently instructed City Council members to attend meetings on a regular basis. Bellevue City Councilwoman Lisa Phillips attended an FMAA board meeting last week, along with several Chantrelle residents, who she said were impressed with the data supplied by Baird. “I think a light went on for them,” Phillips said. City Council Chairman Dave Hattula thanked Baird for the update. “Thank you for lining things out as they are, and not how some would want things to be,” Hattula said. Baird invited members of the City Council to attend ongoing airport master planning sessions scheduled over the next 18 months, which will outline a “dual-path” forward, which maintains safety at the current site, while taking steps to identify a new airport site at some time in the future. Baird said several eventualities could trigger the need for a replacement airport, located south of Hailey and Bellevue. He said a new airport could become necessary if there were no aircraft in the future that met the airport’s weight limitations. Baird said a new airport could also become needed if the Federal Aviation Administration’s accepted modifications to safety standards at the airport no longer met the FAA safety requirements. “That could be a trigger,” Baird said. The City Council announced completion of a three- year, $538,000 water line upgrade, using $350,000 in grants from the Idaho Department of Commerce administered by Region IV Development Association Inc. The Bellevue Chamber of Commerce volunteers completed a roadside trash cleanup of Timmerman Hill south of town.